Stay up to date on the latest business tactics and trends during our highly informative Educational Seminars. Presented by some of the area's most respected leaders in their fields, these seminars will keep you abreast of the most important issues related to business while sharing best practices. -"Developing a Wellness Program for Your Employees and Their Families"
-"Sustainable Business Practices to Boost Your Triple Bottom Line"
The New Berlin Chamber of Commerce has strategic alliances with several organizations, including Waukesha County Technical College, Waukesha County Business Alliance, and the Wisconsin and U.S. Chambers of Commerce. The New Berlin Chamber also sponsors and promotes joint educational opportunities with these strategic partners. 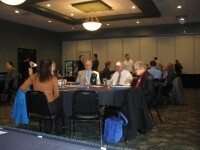 Educational seminars are typically held at New Berlin Chamber businesses and can be a breakfast or luncheon meeting. Breakfast meetings open at 7:00 a.m for light breakfast and open networking. The presentation begins at 8:00 and concludes by 9:00. Luncheon meetings begin with registration and networking at 11:30. The lunch and presentation begin at noon and conclude by 1:00 p.m. Registration fees may vary by event. Chamber members benefit from a reduced member rate. In addition to enhancing your knowledge of important topics, these seminars allow you to network with area business leaders. Make a point to attend each seminar. They will make a difference in your business. If you'd like to offer a presentation, contact Executive Director Ed Holpfer at office@newberlinchamber.org, or call 262-786-5280.